Good morning. If you may allow me to deliver this opening remarks in English, given a number of friends from the overseas maritime community joining us here. I am most delighted to welcome you all to the Opening Ceremony of the Hong Kong Maritime Week 2017. This is indeed the second time the Hong Kong Maritime and Port Board ("the Board") organises such a large-scale event – an intensive week of exchange, networking, talent enrichment and sheer fun. The Sun Yat Sen Memorial Park, venue of today's Ceremony, has some very good views. Behind me is the Central and Western Promenade, where I will often see people jogging, having a walk or taking pictures of the Victoria Harbour. Over the years, many locals and tourists have been amazed by its world-renowned urban landscapes and night scenery, but not all of them realise that the deep waters between Hong Kong Island and the Kowloon Peninsula are why and how a collection of fishing villages would have grown to become an international centre of trade. Likewise, to many, "maritime" seems to be a mystery. Some may have a rough idea of the Hong Kong Port, but they do not know that we have been striving to entrench ourselves as one of the world's busiest container port and that we handled almost 20 million TEUs last year. Some may have learnt of the "maritime silk road" from the Belt and Road Initiative or at a Chinese History class, but the significant economic contributions behind the maritime industry remain unnoticed industry to the general public. This is certainly something that we need to change. 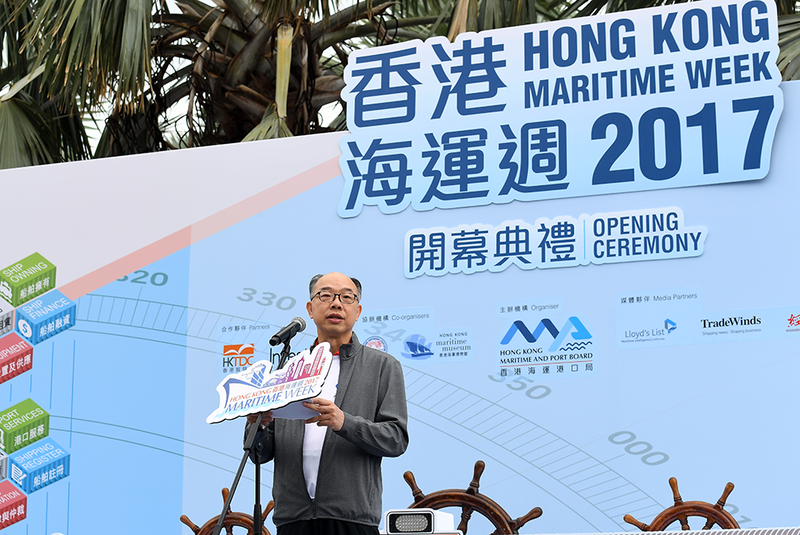 The first-ever Hong Kong Maritime Industry Week organised last year was an important step in raising the community's awareness of the achievements and contributions of the maritime and port industry. As you would probably agree, the Week was a resounding success. Some twenty events altogether attracted around 4,600 local and overseas participants, including both key personalities within the industry and members of the public. And, perhaps more importantly, the Week demonstrated to the society the team spirit, passion and determination of the thousands of members of our maritime cluster, like your good selves, coming together to showcase our strengths and capabilities, and, more than that, our "can-do" spirit. This year, evolving from the strong and robust foundation, we have pooled together resources and efforts of more than fifty organisations from home and abroad to launch around fifty events across the territory throughout the Hong Kong Maritime Week 2017. Each of them will offer a unique perspective on the multi-faceted world of our maritime hub, including the 7th Asian Logistics and Maritime Conference, the first-ever MARE Forum in Hong Kong, and an industry forum looking into the national Belt and Road Initiative, just to name a few. There are also some vibrant and fun-filled community, family and youth events, such as the "curtain-raiser" of the Week – the Orienteering Race to be followed right after this Ceremony. As they say, work hard, play hard! Without doubt, maritime and port industry is more than vital to the economic development of Hong Kong. Through the wide range of maritime services offered by some 800 maritime-related companies to the world every day, there runs a rich seam of world-class expertise and experience, supported by a peerless infrastructure. This has given us an advantage that has served it well for many years. Yet, in today's world with increasing competition and unexpected challenges, we have to always stay ahead of the curve and strive for excellence. Through the Maritime Week, not only do we seek to impress our overseas and Mainland business partners of our high performance, we also aspire to foster greater collaboration and solidarity among our maritime community, so that we may continue to "Propel Hong Kong" as an international maritime centre, with pride and energy. I wish every event under the Maritime Week a huge success, and I hope you will all enjoy it. Before closing, let me cheer for the athletes participating in the Orienteering Race in Cantonese.